If you're a PC user, you've probably already heard of, and got it (if not, why not?). 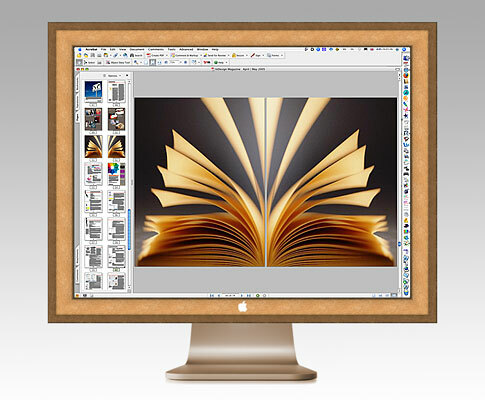 Some Mac users managed to grab an unofficially released version of it a month or so ago. The good news is, it is now officially available for Macs. 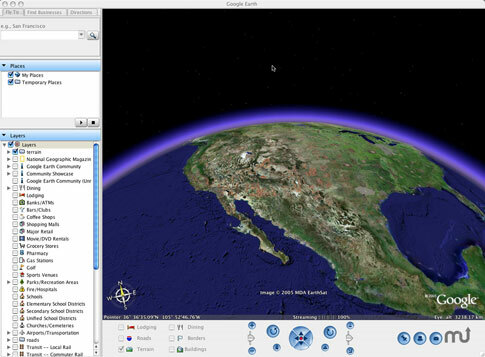 Google Earth puts a planet's worth of imagery and other geographic information right on your desktop. Prepare to waste hours (days if you're on a dial-up account!) finding your house, your place of work (you can tell the photo was taken on a Saturday for my business, the car park is empty! ), then your friend's house, then be disappointed because your parents' house in the countryside is just a mush of green (not everywhere has been aerial-photographed at high resolution). Pando: Share huge files for nowt! 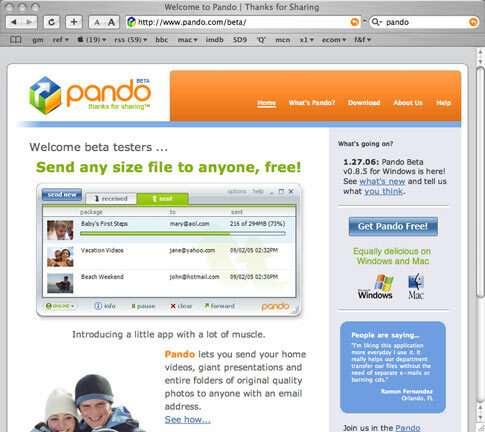 Pando is a new, peer-to-peer file transferring application. It allows you to send large files (during the beta up to 1 Gigabyte) to other users, online or offline. 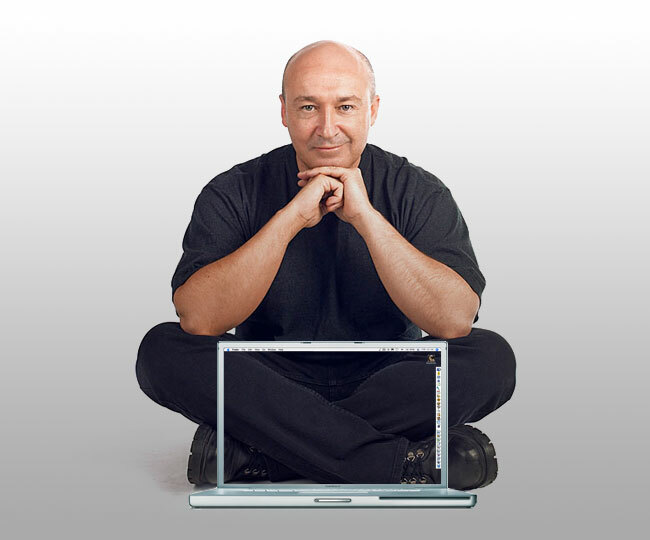 It has a clean interface and is available for PCs and Macs. Sign up for the beta to access the client download (expect up to a week's wait for an invite). I'm not very discerning when it comes to movies. I'm just as happy watching 'rubbish' like Fast and Furious as I am watching more 'intelligent' movies like, erm... (struggles to think of an intelligent movie) Bladerunner, Crash (2005) or Magnolia. I'm increasingly getting into watching TV series' on DVD. I don't always have time (or inclination) to sit and watch a whole movie, but I can watch an episode of West Wing, Desperate Housewives or 24 while eating my dinner, with plenty of time to write my blog afterwards. I'm not quite sure how I came across Firefly. I think it was in the 'if you liked this, you'll probably like this' list on Amazon. When I saw it was created by Joss Whedon (Buffy) and written and produced by members of the Buffy team, I decided to give it a try. I loved it, as did my two boyz Zak (13) and Brook (18). Here's how it is: Earth got used up, so we terraformed a whole new galaxy of Earths, some rich and flush with new technologies, some not so much. Central Planets, them was formed the Alliance, waged war to bring everyone under their rule; a few idiots tried to fight it, among them myself. I'm Malcolm Reynolds, captain of the Serenity. Got a good crew: fighters, pilot, mechanic. We even picked up a preacher, and a bona fide companion. There's a doctor, too, rescued his genius sister from some Alliance camp, so they're keeping a low profile. You got a job, we can do it, don't much care what it is. If it sounds like you'll hate it, you probably will. However, it is intelligently done and, like Buffy, deeply indebted to the world of history and myths. Except this time Whedon is dealing with the myth of America: the Frontier, the Civil War, the rise of the Corporation, etc. Firefly can be watched on a number of levels. It has enough action and humour to be perceived as a fast-moving action flick. But there is enough depth for futher investigation. There are levels of grey in its characters' moral scale. The villains are not slimy aliens, but humans. Whedon seems to be aware that in 500 years mankind will still be its own worst enemy. There are the 'haves' who keep to the government rules. And the outlaws who live in 'The Black' - Whedon's frontier third world - where it is possible to exist without the interference (or benefit) of civilization and government. Like Bladerunner (did I mention I love Bladerunner?) the future has a thick patina of dents and grime. Unlike Star Trek, its Federation-like central power (the Alliance) is interpreted as being ideologically fascist and totalitarian. Whedon is (of course) on the side of those who resisted and lost. Fox (the US channel that originally aired the series) did everything in its power to kill it off, including airing episodes out of order, skipping weeks after only three episodes and, cancelling the show without even airing episodes 12, 13 and 14 (out of 15). 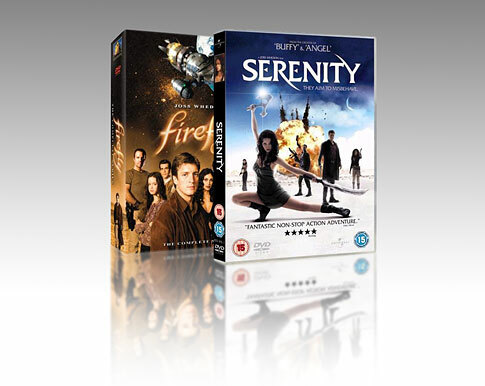 But you can see all 630 minutes of Firefly for just £18 (post free) from Amazon.co.uk. That's just under 3p a fun-packed minute! Whedon wasn't happy at Firefly being canned. And neither were the cast. Fortunately (for Firefly fans like me) Joss managed to get Universal Pictures to let him finish off the Firefly series in a movie, using all the original members of the original series. Serenity is an excellent movie. I took my two boyz to see it on its cinema release. Five minutes into the film, Brook turned to me and said 'They're talking like Manga actors' (poor kid, looks like he's doomed to analyse everything he watches just like his dad!). The film combined a wide variety of film genres, including Manga, Western, Star Wars, Martial Arts and Zombie, all knit into an absorbing, often humourous film. There are plenty of surprises and we all emerged with wide smiles on our faces, vowing to get it on DVD as soon as it was available. It's available on Region 2 DVD from February 27, but if you've got a multi-region player, you can get it now from www.cdwow.com for £9.99 including postage. At least two Saturdays a month I leave my house at 4am and drive to Lincoln to pick up my kidz. I then drive them back to Harrow (via McDonald's at Baldock Services for breakfast). On Sunday afternoon, around 4pm, I reverse the process. One of the things that makes the travelling bearable is my Previa's entertainment system. 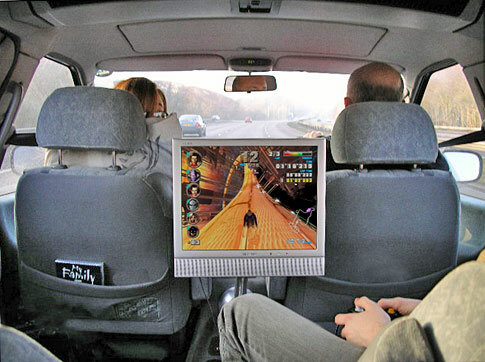 The GameCube and 15" screen keeps the boyz entertained. And the girlz flit between GameCubing, browsing saved emails and MSN conversations on their PowerBooks and reviewing the contents of their mobiles. Dozing is an optional 'activity' shared by all siblingz. My iPod is linked to the A/V system. My favourite 'Smart Playlist' for the sections of the journey when I am by myself is 'genre ≠ spoken word, humour, bad taste, smileworth, comedy, classical, background, chill, kids, parody + has not been played in last 9 months', which provides a wonderful mix of stuff I have never heard before, and stuff I love that I haven't heard for ages. When the kidz are in the car I have a playlist called 'kidz journey' which I compose based on old favourites and new stuff that I think they may like. Those that gain their approval get put into a 'kidz' playlist which, as I type, stands at 3130 songs. Each month I read my way through a tranch of magazines. Word, Uncut, Edge, MacUser, Third Way, Game, Mojo, Q, Wired, Top Gear... Once read, I used to keep them in neat piles 'for reference'. About 5 years ago, I realised that the number of times I leafed through these sacred piles was dwindling. A year ago, I realised I hadn't referred to any of the backissues for at least two years. So, with a sorrowful tear, I bundled them into a recycling bin, and now I dispose of each magazine when its successor arrives. Google is the culprit. It is so much more convenient (and effective) to find information by typing in some appropriate words into the box at the top-right of my browser than ploughing through a pile of publications. And when the information is found, it can be copied and pasted into documents, rather than having to transcribe text from the printed page. So why not just cut out the middle-person? Why don't I stop buying magazines altogether and browse sites with the information I need? There are plenty out there, and it would save me a fortune! One answer is that there isn't the same quality of organised information available online. However, this is fast disappearing as a valid reason. Or maybe it is because I am more comfortable (ah, the old 'familiarity' argument) with reading printed publications. But I've been using a computer screen to read a vast range of data from for nearly 20 years, for many hours a day (much more time than I have spent reading conventional media), so this is a difficult argument to sustain. A year or so ago, I subscribed to InDesign Magazine. To save publishing costs, and to demonstrate the 'extra' benefits of publishing documents electronically it is only available as a PDF file. • You can search for specific words or phrases. • You can transfer data from them into other documents. • Navigation and HTML links can be embedded. • Sound and movie files can be included. 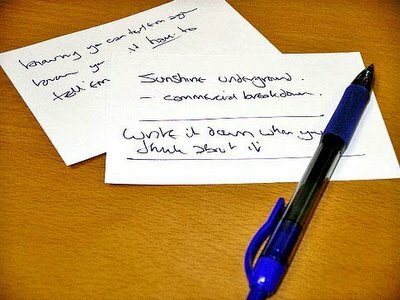 • Scribbling notes in the margin is easier. • Leafing through pages is easier and quicker. • I can read the pages in a wider range of environments. • I can separate out pages for disposal or distribution. And once again I've reached my self-imposed time and length limit. In the next 'Digital v Analogue' article I'll tackle the issue of spatial dynamics and aesthetics. A few weeks ago, Cyan asked me what the time was. Assuming she hadn't seen the large clock on the wall above her, I told her the time, and pointed out its presence for future reference. "Oh, I know" was her reply, "It's just that it's one of those clocks with hands, and it's a pain working it out". Call me old-fashioned (pauses for predictable hilarious responses...) but I was shocked. A quick check with her siblings revealed that all but my oldest child are happier telling the time with a digital watch than with the 'old-fashioned' version. Now one of my many obscure interests/obsessions is the science of legibility. Design and typography is all about legibility, both enhancing and obscuring it. Human vision is a flawed and marvellous thing. Our eyes are (compared to many other animals, and especially compared to modern cameras) very average image-capture devices. It is the human brain's image-enhancing software that does the lion's share of the work in providing us with the impressive grasp of what we see around us. Humans are analogue creatures, evolved/created to live in an analogue world. We aren't very good at the 'exact' stuff... ask someone to tell you the dimensions of two pens lying side-by-side, and the answer will be vague, but ask them which one is longer, or thicker, and the answer will usually be immediate, and accurate, even if the differences are very small. Similary, most people are good at noticing when something isn't straight and at detecting variations in colour. We're good at the 'difference' stuff. Which is why the received wisdom on legibility favours analogue. 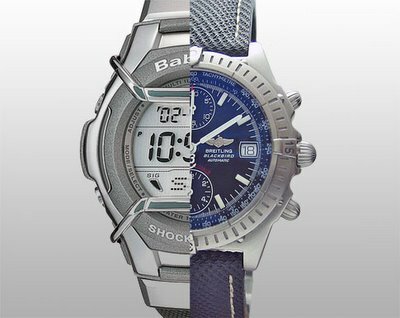 A glance at an analogue clock should tell us the time quicker than a glance at a digital watch, because there is less processing for our brain to do. That is why, up until recently, the speedometer, rev counter and other 'instant' information feedback gauges in cars have been analogue. However, legibility is also about familiarity. From early childhood I was taught how to tell the time on analogue timepieces. The shapes are lodged into my subconcious. Not so with my three youngest children. They are more familiar with telling the time looking at numbers, not shapes, and so they are quicker at doing it this way. Fascinating fact to throw into a lagging conversation: Have you ever noticed that analogue timepieces that employ Roman numerals, represent '4' as 'IIII' rather than 'IV'? 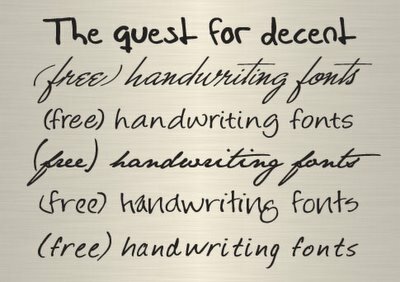 Digital handwritten fonts, a new oxymoron? 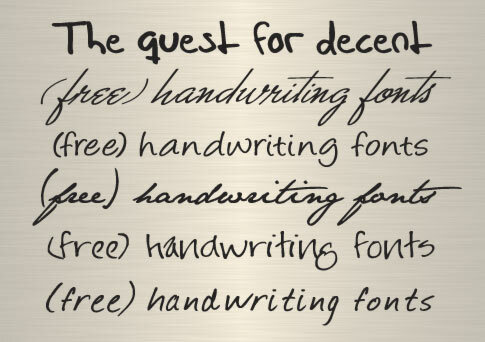 There comes a time in every designer's life when a handwritten look is required. Even in the age of digital, the best way to get a handwritten look is to write it by hand, scan it, and drop it into the document you are preparing. But if changes are likely to be required, or if you are preparing stuff in a hurry (or if you are just plain lazy) a well-produced typeface can make a very good substitute. A couple of them are restricted to prevent them being embedded in files like PDFs, so do check before you commit to using them in this way. Oh, and if you're using an image-editing program, a soupcon of gaussian blur will help the text appear more homespun. There are quite a few utilites like this available, but this one is online, and comprehensive, covering mono, contrast, triad, tetrad and analogic colour combinations, with pastel, contrast and pale variations! The human brain is a marvellous and mysterious thing. Carrying out 24/7 monitoring and managing of thousands of body processes and capable of storing, organising and retrieving millions of items of information. And yet I regularly reach the top of the stairs and wonder what it was I had ascended them for. Or have a 'brilliant' thought during a long car journey, then realise that although I remember having the thought, I can't remember what it was. Or hear a song, like it, but - within minutes - forget what it's called, or who it's by. Now I'm sure that neuroscientists will eventually find a logical explanation for this, and there may even be a day when there are ways of 'logging' your brain's processes. Until that day, we're stuck with more mundane methods of remembering things. I've investigated and tried a lot of methods of making sure I don't forget things. Computers are helpful, mobile phones better... but probably the most useful tool in my 'don't forget' armoury are 12 x 8cm cards. And a writing implement. Pieces of card are cheap, require no power source, are rugged and disposable. And my brain's OCR equipment is brilliant at interpreting even the most illegible scribbles. And by keeping to a 'one card, one idea' principle, they are easily filed or carried, before eventually being disposed once the task has been completed, or transferred to appropriate digital storage systems. Now, where did i put that pen? At first glance, Apple's new iWeb package seemed to have removed my excuse for not doing a simple-to-use, drag'n'drop blog. 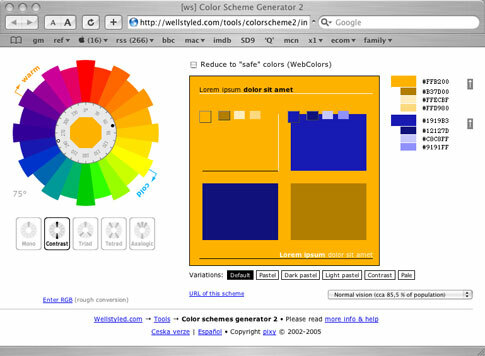 Here at last was a simple-to-use interface which produced attractive web layouts. So, I purchased the package and spent Saturday afternoon exploring the program and putting a preliminary blog together, only to realise that it doesn't have any kind of provision for comments! So, until iLife with comments materialises, I've decided to compromise and am going to run this site in parallel with my brettstuff site. There will be times when I still want to make things look pretty, so I'm not abandoning it completely... I'll put links to it as it is updated, and this site will become the RSS feed for it, so get rid of the brettstuff RSS feed, and replace it with this one. Oh, and now there is provision for comments, feel free to provide feedback.